So much for the brawl lighting a fire under the Yankees. If not for a too little, too late ninth inning rally they would’ve been thoroughly dismantled by the Red Sox for the second time in three days Thursday night. The final score was 6-3. The Yankees’ top three starters — or three of their top four starters, I guess — allowed 17 runs in 13 innings in the three-game series. Pretty terrible! What was wrong with Gray? Well, everything. He threw a first pitch strike to only nine hitters. He went to a two-strike count on only eight batters, and five of them reached base. He went to a three-ball count on four batters but it felt like 14. The location wasn’t good, the breaking ball was generally flat, and there was no out pitch. Three starts into the year, Gray has allowed ten runs and 26 baserunners in 13 innings. He’s averaging 18.7 pitches per inning and I’m shocked it’s that low. Gray was awful. So was his defense. I’m not excusing Gray! He was terrible. But he had help being terrible. Tyler Wade tried to cut down a runner at the plate and the throw short-hopped Gary Sanchez at home. I’m not sure they get the out even with a good throw, but the bad throw was emblematic of the team’s play overall. Giancarlo Stanton misplayed a routine fly ball into a double. He overran it and it dropped in. Sanchez tried to get the lead runner at third on a strikeout/wild pitch and the throw was late. Gross. Sloppy all around. The season is 13 games old and that’s nothing. More than enough time (and talent) to turn things around. At the same time, the Yankees have now committed eight errors in their last six games. Errors are not a good way to evaluate defense, but in this case, that total matches the eye test. They would’ve lost Thursday even with good defense. There are just too many mistakes being made though. Gray was terrible. It would also be nice to see someone other than Didi Gregorius, Brett Gardner, and Aaron Judge play sound defense at some point. Uninspiring showing from the offense. Rick Porcello was everything Sonny Gray was not. Aggressive, quick-working, and able to avoid hitter’s counts. Porcello’s pitch count by inning: 12, 18, 15, 10, 5, 14, 25. He was throwing a lot of strikes — a lot of strikes — so the second time through the lineup, the Yankees shifted gears and started swinging early in the count. Falling behind 0-1 and 0-2 wasn’t working so well. Neither did swinging early. 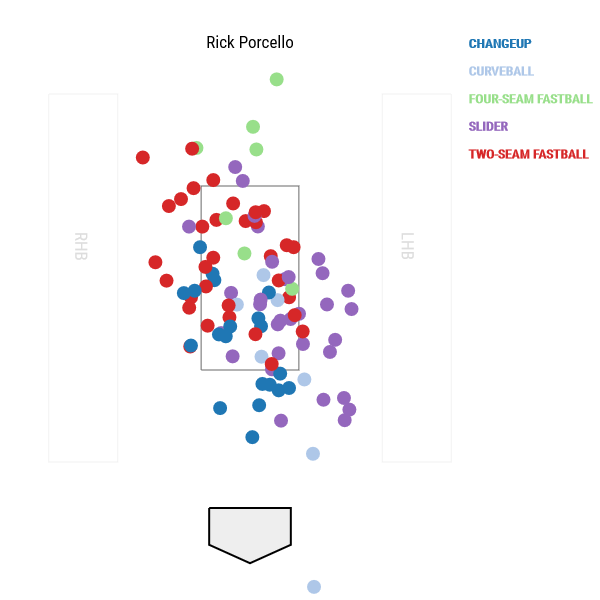 Porcello filled up the strike zone all night. He was great. 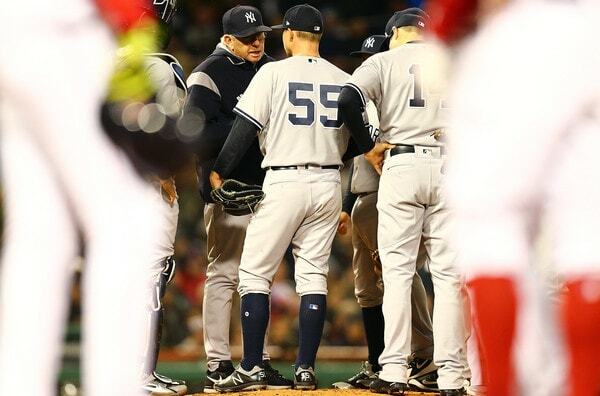 The Yankees stunk. It wasn’t until the ninth inning, when Alex Cora decided 29-year-old rookie Marcus Walden was the right man to face the Judge-Stanton-Didi-Sanchez portion of the lineup, that the Yankees got on the board. Judge walked, Stanton reached on an error, Didi walked, and Sanchez cleared the bases with a rocket double. Cora then went to Craig Kimbrel, who snuffed out the rally. Prior to the ninth inning, the Yankees had three hits total. Judge’s double, a Stanton infield single, and booming Ronald Torreyes double to center field. Torreyes might not hit a ball better all season. I’m not trying to dump on him! That’s just not his game, banging doubles off the wall. Heck, include Sanchez’s bases-clearing double and the Yankees still only four hits. At least they didn’t get shut out for the first time this season. Small victories. Aaron Boone gave Tommy Kahnle and Adam Warren an inning each as the Yankees look to get them both right. Kahnle’s heater averaged 95.0 mph, which is still down from last year but is up from his last outing, so I guess that’s good. He’s maybe trending in the right direction. Kahnle walked a batter, otherwise he and Warren had quick and uneventful outings. And finally, welcome back Aaron Hicks. He returned from his intercostal injury and went 0-for-4 with two strikeouts. His at-bats were good though. Hicks just didn’t get results in his first game back. Glad he’s back in the lineup though. The Yankees need all the help they can get. This three-game series is over and the Yankees are now heading to Detroit for a three-game weekend set with the rebuilding Tigers. Jordan Montgomery and Mike Fiers are the scheduled starters for Friday night’s series opener.